Lithuanian President mourns the destruction of a community which was once a cornerstone of European Jewry. Lithuania on Monday marked 70 years since Nazi Germany wiped out the Vilnius ghetto, all but obliterating the vibrant Jewish culture of a capital once known as the "Jerusalem of the North". State leaders and Holocaust survivors attended a memorial ceremony honoring the tens of thousands who died, while national flags with black ribbons dotted the Vilnius skyline, known as "Vilna" in Yiddish. "A grim and terrible reality can never be left in the past - it must forever remain in our memory," Lithuanian President Dalia Grybauskaite said at the ceremony. She praised those who saved Jews as "icons of humanity to be role models for all of us" and "beacons that we must carry on the path to tomorrow". Jews settled in Vilnius in the 16th century and by World War Two numbered around 70,000, accounting for around one third of its population and serving as a hub of Yiddish intellectual life. But around 200,000 Lithuanian Jews - more than 90 percent of the country's pre-war Jewish population - died at the hands of the Nazis and local collaborators. The Holocaust remembrance group Yad Vashem has awarded more than 800 Lithuanians the title of Righteous among the Nations for having sheltered and saved their Jewish neighbors from the Nazis. Today, some 5,000 Jews live in the Baltic nation of three million people, which joined the European Union and NATO in 2004 and currently holds the rotating EU presidency. Vilnius was once home to prominent Jewish intellectuals and artists, and Yiddish, the shared language of eastern European Jews, was widely spoken. Vilnius' pre-war Jewish community is particularly famous for having produced the eighteenth century Jewish scholar and mystic Rabbi Eliyahu Kremer, more famously known as "The Gaon [genius] of Vilna," whose teachings still have an immense impact on Jewish scholarship and practice. Other late residents of note included Moyshe Kulbak, writer of Soviet satires; poet Avrom Sutzkever, who testified at the Nuremberg trials of Nazi war criminals; violinist Jasha Heifetz and historian Simon Dubnov, who wrote a comprehensive account of the Jewish people. On Monday, members of Vilnius's tiny Jewish community gathered at the city's sole surviving synagogue - out of more than 100 before the war - to read out the names of the ghetto victims. Survivor Fania Brantsovskaya, 91, recalled her lucky escape on September 23, 1943. "It was a matter of five minutes. As we left the ghetto, we saw the military coming. But at that time, we didn't think it would be liquidated," she remembered. Brantsovskaya read out the names of her late father, mother and sister. She said she is just one of five ghetto survivors who remain in Vilnius today. A few others are abroad, including Simon F. Malkes, who has lived in France since the 1950s but flew back to Vilnius for the anniversary. The 86-year-old survived by hiding for 48 hours in the cellar of a Nazi labour camp where he was moved to just weeks before the ghetto's liquidation. "The hiding place was built by my father and some friends in the cellar. It was made for 12 to 15 people. In the end there were 37 of us. You had no air, you had no water, it was just horrible," a teary-eyed Malkes recalled. He then hid in a corn field and a local hospital for weeks before the Soviets ousted the Nazis from the Baltic states in July 1944. Being an anti-Communist, he fled to the West and only returned for a visit after Lithuania broke free from the crumbling Soviet Union in 1990. Individuals and state institutions alike are trying to revive the memory of this Jewish heritage by harnessing the global reach of the Internet and launching a series of interactive websites. It is a way to restore a lost chapter in the history of this Baltic country with a controversial past as some Lithuanians collaborated with the Nazis during the 1941-1944 occupation. "There is... a terrible lack of commemoration in modern-day Vilnius," says Menachem Kaiser, an American Jew who set up a website about the Jewish ghetto after spending a year in the capital. "If you're there, walk around - there is virtually nothing to commemorate the rounding up and murder of 80,000 Vilnius Jewish residents." It has been 70 years since the Nazis liquidated the ghetto on September 23, 1943. Learning of its existence prompted Kaiser to create the English-language website www.revilna.org, a reference to the city's name in Yiddish, Vilna. "Finding out about the ghetto was very difficult, very frustrating, and I wanted to create something so that even the non-scholar could get a sense of what the ghetto was like," he told AFP in an email. "By doing this project as a website, as opposed to a book, I was able to make something dynamic, that allows the user to quite literally explore." That complicity makes the Holocaust a sensitive issue in Lithuania, which has in the past come under fire for being slow to prosecute collaborators. Central to the issue is the one-two blow that hit Lithuania during World War II. The country was occupied by the Soviet Union in 1940 under Moscow's secret pact with Nazi Germany, and the Soviets killed and deported thousands of its citizens. Germany then drove out the Red Army in 1941 and its arrival was seen as a relief to some Lithuanians, who believed the Germans would guarantee a return to independence. Lithuania has taken steps to address its role in the Holocaust. Last year the government approved a special compensation fund for Jewish property seized by Nazi Germany and then kept by the Soviet regime. "We talk too little about the history of the Jewish community, of its daily life and contributions - and yet that would bring a better understanding of this great tragedy," says Lithuanian historian Jurgita Verbickiene, who runs the history site www.zydai.lt. Lithuanian author Milda Jakulyte-Vasil runs the "Holocaust Atlas of Lithuania", a bilingual site with an interactive map of where Jews died. "The website was first thought of as a complement, a way to promote the book, but ultimately it became the main medium," said Jakulyte-Vasil, who works at The Vilna Gaon Jewish State Museum. "The advantage is that the information becomes accessible to everyone, and for free." The site www.holocaustatlas.lt, whose exact geographic coordinates help those looking for traces of their vanished kin, was co-funded by the Austrian embassy in Vilnius and the European Holocaust Research Infrastructure. To mark the 70th anniversary of the Nazi atrocity, Jakulyte-Vasil also set up the site www.holocaustnames.lt, which compiles the names of all Lithuanian Jews who died in the Holocaust, as well as those who survived. Funded by the office of Lithuania's prime minister, the site will eventually allow visitors to complete the database by adding biographical information and additional names. The Lithuanian Special Archives, which stores documents from 1940 to 1991, has also joined the trend. Since late August, their website features a virtual exhibition devoted to the Vilnius ghetto. "It's mostly a way for us to better disseminate the archives," says co-curator Nijole Maslauskiene. 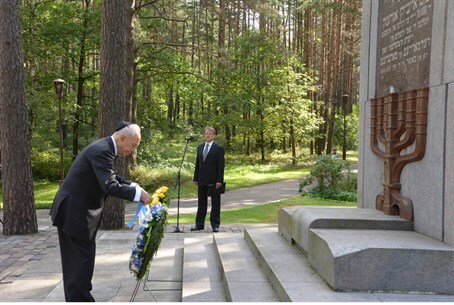 Last month, Israeli President Shimon Peres - who was born near Vilnius - paid a visit to a memorial on the outskirts of the city in tribute to the slain Lithuanian Jews. Peres praised Lithuanian efforts to remember and "educate its youth about this shameful stain, so as (to) never allow it to happen again".